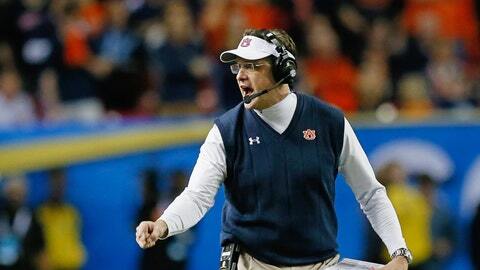 Gus Malzahn's Tigers have been on an incredible run and are a win away from a national title. A week ago, before Florida State rocked Duke and Auburn rolled through Missouri in their conference championship games, Johnny Avello had the No. 1 Seminoles as a 13-point favorite over the then-No. 3 Tigers. Avello, the sports operations director who sets the lines at Wynn Las Vegas, watched Auburn beat Missouri, locking up the No. 2 spot in the BCS after Ohio State lost to Michigan State in the Big Ten title game, and tried to gauge the public temperature regarding the SEC champion. Just how much do people believe in Gus Malzahn’s Tigers? He made a four-point Auburn adjustment — an uncommon swing this late in the season — and set the Wynn’s opening line Monday morning at Florida State minus-9. Immediately, Auburn money began to roll in. "I knew there would be Auburn support," Avello said over the phone. "You’ve seen [Auburn] beat Alabama and a good Missouri team over the last couple weeks. People who have been watching this team — my bettors — are going to think not only can Auburn cover this spread, they can win outright." Some action in the $10,000 range dropped the Wynn’s line to 8.5 and then 8, where it currently sits, a number that exposes a blatant dividing line: how Vegas experts feel about Auburn compared to most everybody else in America. Avello actually might be more generous to Auburn than other Vegas experts who either set lines or analyze them. The guys at Don Best Sports, Chief Operating Office Kenny White and analyst Todd Fuhrman, who also serves as FOX Sports 1’s Vegas insider, believe the actual divide between Florida State and Auburn is far wider than the public seems to realize. "You would think in a game between the No. 1 and No. 2 teams, [the spread] wouldn’t be that big of a gap, but this isn’t the No. 1 versus No. 2,” White told me. "This is our No. 1 team versus our No. 13 team." In its latest power ratings released this week, Don Best rates FSU as a 127.5 – meaning, FSU is 27.5 points better than an average team with a baseline of 100. Auburn rates 115, a half-point better than Missouri, South Carolina and UCLA and a half-point worse than Oklahoma. How is it that the SEC champion — the "best team in the nation’s best conference," as some might commonly label the winner of the SEC title — falls so far behind other teams with seemingly inferior credentials? Well, simply, Vegas doesn’t sing the same narrative tunes that made-for-TV BCS debates do. Instead, it’s basing its evaluations on three cold realities that zoom by the emotional radar of the general fan. "Our calculations are based on performance on the field," White said. "We want to know how efficient a team is moving the football." Don Best analysts look at what they call a "box score final," Fuhrman told me. It’s the product of their statistical dilution process. They crunch a wide variety of statistics — yards per pass attempt, yards per rush allowed, third-down efficiency and so on — and then start stripping away the layers of random results. So turnovers are factored in, but not much because they believe they are mostly random outcomes with the margin being widely unpredictable. Then they strip away big plays — "We feel those are mostly random and luck, too," White said — to reduce the data to its most granular level. So, essentially, they’re examining singular cells of a team’s production and then extrapolating those out to predict future performance. If the cells look healthy, the organism should be as well. This information is more telling to White and Fuhrman than records or final scores, which is an important point to understand as it pertains to Auburn because it’s the basis of White’s reasoning for ranking the Tigers 13th this week. "My defense is they lost to Georgia and Alabama," White said. Of course, Auburn didn’t actually lose to those teams — you’ve surely seen the all-time great clips by now with Auburn radio man Rod Bramblett yelling over them, but here’s Georgia and Alabama if not — but White marks them as defeats for the power rating calculations because of the extraordinary fortunate involved. "The bowls are based on wins and losses, but they weren’t supposed to win [those games]," White said. "Two unbelievable plays catapulted them." The point, as White or Fuhrman or Avello or anyone in Vegas would note, is not to knock Auburn. It’s just their jobs to discover the true talent level of teams so they can predict future performance as accurately as possible, and that process requires cutting the narrative layers that harden on top of each magnificent victory. "In the end, winning is the name of the game, but beating Georgia took the hand of God, and beating Alabama also took some luck," Fuhrman told me. "It makes for a good story." In the last two months, as Auburn’s magical run took shape, Vegas did give it credit, making appropriate rating tweaks. But the thing to learn here is those who predict performance for a living don’t believe the Tigers’ true performance has changed all that much in their recent barrage of SEC victories. Only our perception – powered by emotional pistons that fire a little faster when a string of remarkable (and almost surely unrepeatable) things happen – of Auburn’s performance has significantly changed. 2. An SEC "team of destiny"
Another reason Vegas is more bullish on Florida State in the BCS championship is that it’s not being influenced by the orchestra that accompanies SEC teams on fairy-tale runs. Both White and Fuhrman agreed there’s an inherent bias at play, because Auburn comes from the conference most would agree is the nation’s strongest. "A Big Ten team may not be getting the same [respect]," Fuhrman said. All of which is totally irrelevant when gauging one team against another at a neutral site. There’s no powerful conference powder Auburn can take to Pasadena and sprinkle on the field before kickoff, but its league affiliation and destiny narrative are two other factors driving up Auburn’s valuation. "This is a prime opportunity, with Auburn’s value at an all-time high," Fuhrman said. "If you relate it to the stock market, you’re paying a premium on Auburn stock. Now is a chance to sell high." Vegas anticipates sharps to back Florida State and get their bets down early, knowing the public will bet the favorite later and drive the line up a couple points by game time. The pros, not beholden to the destiny lens, currently see value in Florida State. The Seminoles rank third in yards per pass at 10.3 and ninth in yards per rush at 5.69. Auburn ranks 18th at 8.5 and fourth at 6.46, respectively. Vegas analytic guys count this as an edge for Florida State. On defense, they count the ‘Noles as a massive favorite. FSU ranks first in yards per pass allowed at 4.9 and ninth in yards per rush allowed at 3.14. Auburn’s ranking in those categories: 83rd (7.4) and 86th (4.59). Don Best considers the Tigers worse than that against the pass. "A lot has been made about how Auburn has performed in spurts," Fuhrman said. "But if you look at the defensive metrics, they give up a substantial amount of yards." This doesn’t mean Auburn can’t beat Florida State and win the national championship. That’s an important distinction. Vegas isn’t interested in predicting the outcome as much as it is in drilling down the probability of performance. Everybody knows anything can happen in one game. "I’m not saying Auburn can’t win," White told me. "We have them at a 23 percent chance of winning. So if they play [Florida State] four times, we think they’d win one of them." It comes back to Avello, who’s sitting at the Wynn and trying to figure out how people will react to his line. To figure that out, he has to consider the team of destiny narrative, the SEC affiliation, emotion and all the intangible stuff data crunchers weed out. "These are all little things I have to have in my bag of tricks," he says. After all the parsing and analyzing, Avello reiterates his only role in this transaction. "My job as an odds-maker is to put out a number that’s an attractive line, not try to pick who will win," he said. "I’m on the outside — all I am is a numbers guy." Yeah, he’s just a numbers guy — one who is testing your loyalty. Players at the Wynn have stuffed their pockets on Florida State and Auburn all year, with the Seminoles going 11-1 against house lines and Auburn going 10-2. Avello knows Seminole backers will likely back them again, and Auburn supporters, after what they’ve witnessed in the last month, have little reason to think the Tigers aren’t just as good Florida State. He’s reaching his hand out and trying to find the pressure point, the number at which loyalty will begin to flip. Avello is just a numbers guy, and the spread is just a digit acting as an ignition for a little harmless gaming. This is No. 1 versus No. 2, ACC versus the SEC’s team of destiny. He’s on the outside, fiddling with numbers, knowing nothing more than you. Teddy Mitrosilis writes and edits college football for FOXSports.com. Follow him on Twitter and email him at tmitrosilis@email.com.